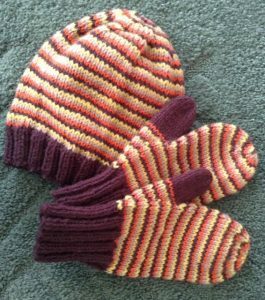 Do any of you remember the fabulous cluster stitch hat knitting pattern I published a few months ago, courtesy of reader Ginny? It was an enormously popular post, and I was so thankful to Ginny for offering it to me to publish here. Well, a few days ago I heard from Ginny again! This time she wrote to let me know she’d found another terrific way to use leftover yarn. What she wrote really excited me, as did her beautiful photos! It compelled me to ask if I could publish her words as a guest post. And I’m thankful to report that she said yes! 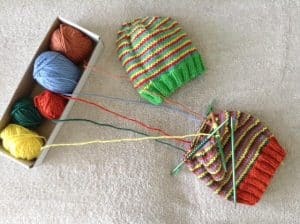 Here is a solution I found for the small amounts of yarn left after I knitted hats for Orphans in Tanzania. This knitting technique is called helix or spiral knitting. You can use this technique for any pattern you knit in the round. One colored yarn chases the color in the previous round around but never exceeds it. This allowed me to create hats and mittens for our local shelter with little effort. At least three different contrasting colors of yarns work best for helix knitting. 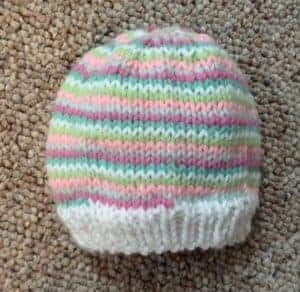 My first attempt at helix knitting was a baby hat. Here I used six strands of pastel yarn, no longer than 6 yards each. With success there, started on hats for older children. This time, I placed the yarn in a narrow box to keep the order and from tangling. When I finished knitting one color, I rotated the yarn to the far right. That shifted the next color to be knit to the far left. This technique worked best for me in keeping yarns straight. Here is a site with a video showing helix knitting that was helpful to me when setting it up for the first time. In the photo below, one can see the swirling spiral on the finished the crown of the hat. When doing mittens, especially for smaller children, this did become more of a challenge. So here, I limited my colors to no more then 4 different yarns. 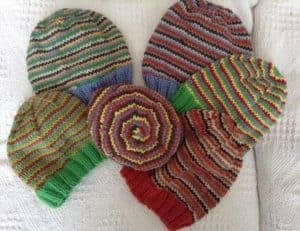 Here is a link to a Fran Rushworth’s blog who is so adventurousness by helix knitting with 10 beautifully dyed yarns. Fran keeps them from tangling by arranging them on a woven plate, which she rotates around as she knits. Thinking about taking all my favorite colored yarns (some spun, having texture) and knitting a scarf with a matching slouchy hat to brighten up my solid winter coat. 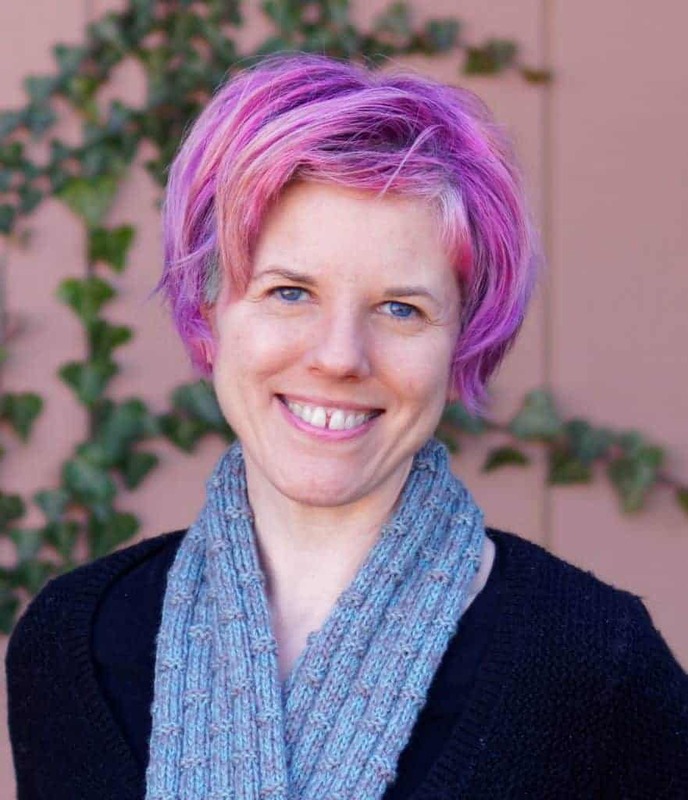 Note from Nicole: For a thorough, step-by-step guide to helix knitting, I highly recommend this TECHknitting blog post on the topic. Ginny Jovanovich is a happy knitter looking for new ways to play with yarn and living in Wisconsin. Just wondering about all of the ends to weave in. Any advice for finishing? That’s an excellent question, Judy. Let me ask Ginny, and I’ll get back to you (and update the post) when I hear from her! Hello….checking in on the decrease advice for this helix hat! Is there a full pattern available? Rib stitch for 1 1/2 to 2 inches. Here is the formula I use for the 8 point dec on the crown of the hats. Number divisible by 8 equally minus 2 equals the stitch number between on the first dec row. Example: 72 divided by 8 equals 9 then minus 2 …..
Now that 8 stitches remain draw thru yarn and weave in the ends. Start crown dec following dec formula above. There are many head sized charts on Pinterest a good guide when knitting hats of different sizes new born to adult. This is a great technique! Can’t wait to try with the bits and bobs I’ve never been able to part with! 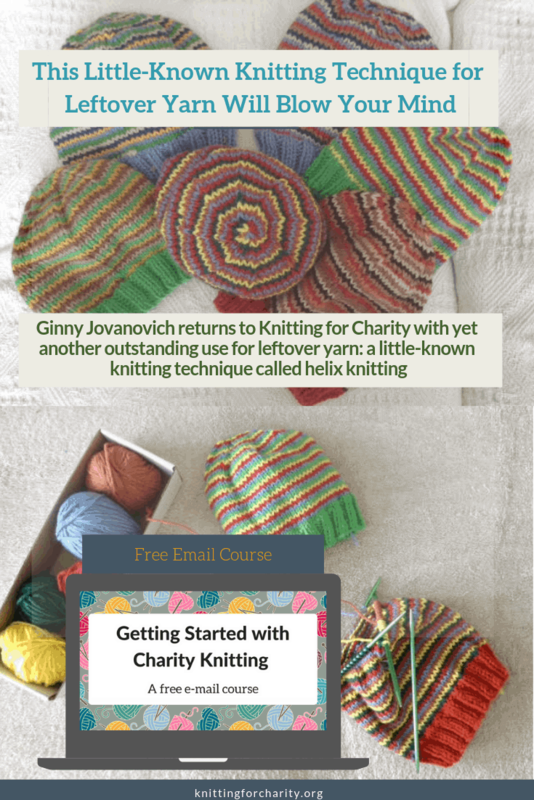 But I’d also LOVE Ginny’s pattern for the helix hat…not sure I trust my decrease knowledge to make that lovely spiral! I use left-over yarn on straight needles. Use a basic color and 1 or 2 contrasting for stripes. Use a #8 needle, K1, P1 OR k2, P2 for 5″ add stripes for 1-2 inches, knit for 8″ total, then use any reduction of stitches for top. I’ve made these since 2003 and believe I’ve made hundreds for charity over the years. Thanks so much for sharing, Bobbie! Hi Sue! I’m checking with Ginny to see if she has a specific hat pattern she uses. If not, I’m sure I can find a few patterns from Ravelry that you may be interested in. Thanks! does she have a specific pattern for the gloves and hat? I love it!! I figured the hat was a normal pattern but for the gloves I am not sure. That is a very good question, Sara. I’ll ask Ginny! 2fer! Learned helix knitting plus using woven dish to place yarn on and spin to select. Thanx for sharing! You’re welcome, Jo! I agree that woven dish idea is pretty golden. I need to scour my house to see if I have something like that!